What Does Code P0904 Mean? Today’s transmissions, whether they be manual, automated manual, adaptive dual clutch, or automatic, are more highly monitored and, in some cases, controlled by the engine control module and transmission control module (ECM and TCM). On some vehicles, the TCM may be integrated into the ECM. On automatic and automated-manual transmissions, the ECM and TCM work together to modulate engine output and transmission engagement, even tweaking gear engagement to be as smooth or powerful as desired. Even on manual and adaptive dual clutch transmissions, the ECM monitors TCM and transmission readings to effect precisely-timed throttle blips and fine-tune engine output. Depending on transmission type and automaker, the TCM may use different sensors to monitor and control the transmission, such as speed sensors, pressure sensors, and temperature sensors. Many of these transmissions also have gate select position (GSP) sensors, which may be mounted on the transmission, shift lever, or shift linkage. Position sensors tell the TCM which gear position the driver has commanded for at least a couple of reasons. If the ECM detects a problem with the GSP sensor circuit, it will store a diagnostic trouble code (DTC) in memory and illuminate the MIL (malfunction indicator lamp). 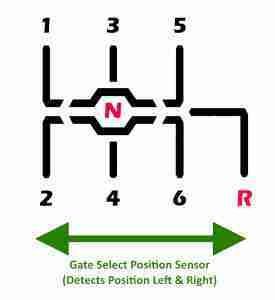 DTC P0904 is defined as “Transmission Gate Select Position Circuit Malfunction,” and may be accompanied by other GSP sensor codes, such as P0905, P0906, P0907, or P0908. What are the common causes of code P0904 ? Depending on year, make, and model, DTC P0904 may have number of causes. Here are some of the most common. Misalignment – This usually occurs after a transmission repair, which may have involved the sensor itself, the shift linkage, or the entire transmission. The technician may have misaligned the sensor or neglected to torque its mounting screws properly. If the sensor is misaligned or is sliding around, it may not report gear select position properly, causing this problem. Fortunately, alignment is usually a straightforward adjustment. Use Loctite Blue 242 or similar to keep the bolts from backing out after adjustment. Faulty sensor – As with all electronic devices, the GSP sensor can fail. Sensors exposed to the elements or that coffee you spilled in the console can easily lead to corrosion and failure. What are the symptoms of code P0904 ? Depending on system design, you may or may not experience any problems apart from the MIL. Some symptoms may include not being able to start your vehicle, erratic shift patterns, harsh or delayed gear engagement, or “missing” gears. How do you troubleshoot code P0904 ? Because this DTC refers to a circuit problem, you’ll need at least a DVOM (digital volt-ohm meter) to diagnose the GSP sensor and the circuit between it and the ECM or TCM. A scan tool with live data streaming capabilities may also be helpful in diagnosis, as it will show you what the ECM or TCM is seeing. Usually, circuit problems, such as loose connections, corrosion, or damaged wire harness, cause this DTC to be recorded, but alignment problems can potentially cause this problem. 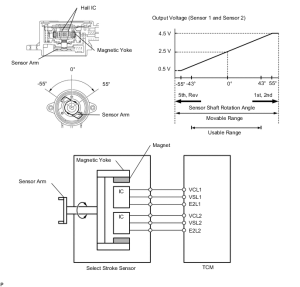 Sensor Alignment – First, check the alignment of the sensor. The scan tool may come in handy for this step. Adjust as needed. Rotation sensors typically need to be aligned to a “neutral baseline” to properly detect gate select position. If it is off to one side or another, GSP voltages may be skewed to one side or the TCM may detect more than one position at a time. Be sure the sensor mounting screws are properly torqued to prevent movement of the sensor case. GSP sensors on the shift lever or shift linkage may depend on physical contact, tabs or buttons forming the basis for these sensors or switches. Over time, plastic or metal tabs may weaken, bend, or break off. At least a couple of brands use magnetic micro-switches to sense position, and the magnets have been known to come loose. Repair or replace any obviously-damaged parts. Circuit Checks – You’ll need an EWD (electrical wiring diagram), specific to your year, make, and model, to diagnose the circuit running between the ECM and GSP. Inspect the GSP sensor, connector, wire harness, and ECM or TCM connector for obvious damage. Check connectors for corrosion or evidence of water entry, damaged or loose pins. Make sure all connectors are seated properly. Repair as necessary. Disconnect the ECM and GSP and check for continuity. If you measure more than 5 Ω, repair the wire harness as necessary. If you measure less than 5 Ω, suspect a failed GSP sensor, but do not condemn it until you finish circuit checks. Check for short circuits between each line and from each line to ground. If you measure less than 10 kΩ resistance, repair the wire harness as necessary. 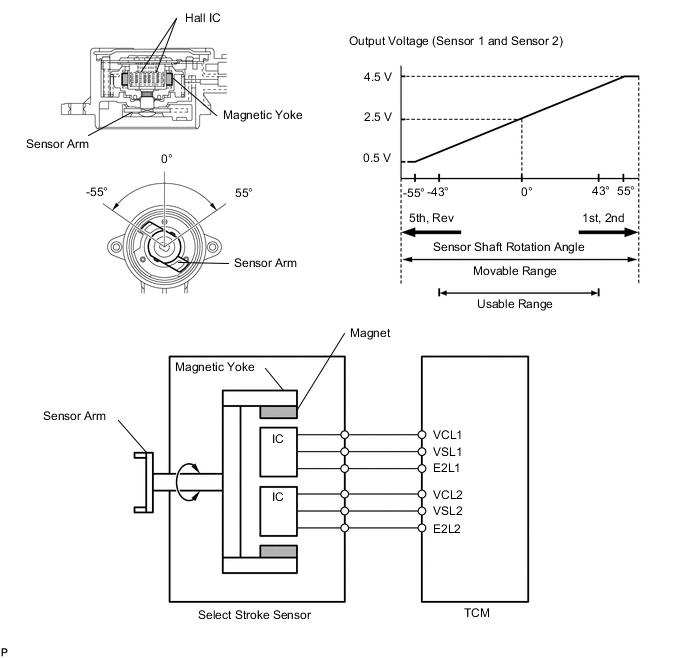 If you measure more than 10 kΩ, suspect a failed GSP sensor. If scan tool and circuit diagnostics result in no problem found, you may have a failed ECM or TCM, but this is not common. None found. Ask a question about P0904.